Galette des Rois or King Cake refers to the three kings who visited baby Jesus just after he was born. Traditionally, this day is known as Epiphany and is celebrated on January 6th. There are many versions of this cake. 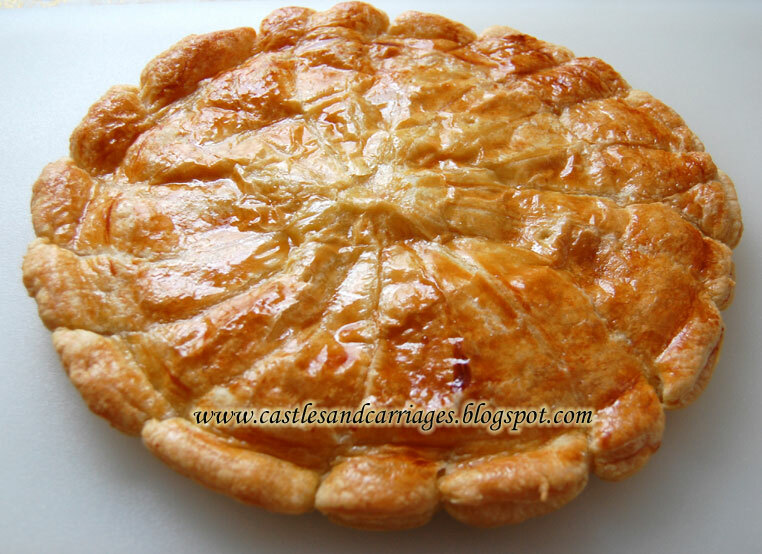 In northern France, a galette made with puff pastry and almond paste, is preferred. In southern regions, a gateau made with brioche and lots of candied fruits is made instead. 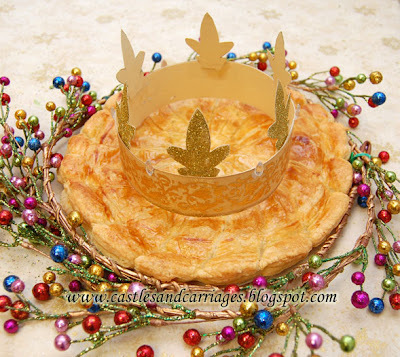 The galette or gateau comes with a paper crown and a little trinket baked inside called a feve. These days feves are made of plastic but many years ago a little bean (which is what feve means) was used. Tradtionally, the youngest person at the table will close their eyes or go under the table deciding who gets the next slice of cake. Whoever gets the feve becomes king or queen for the day and gets to wear the paper crown. The following recipe uses a more traditional filling using almonds but there are cakes made with chocolate, pear or apple fillings. If you would like to make your own almond paste please click here! 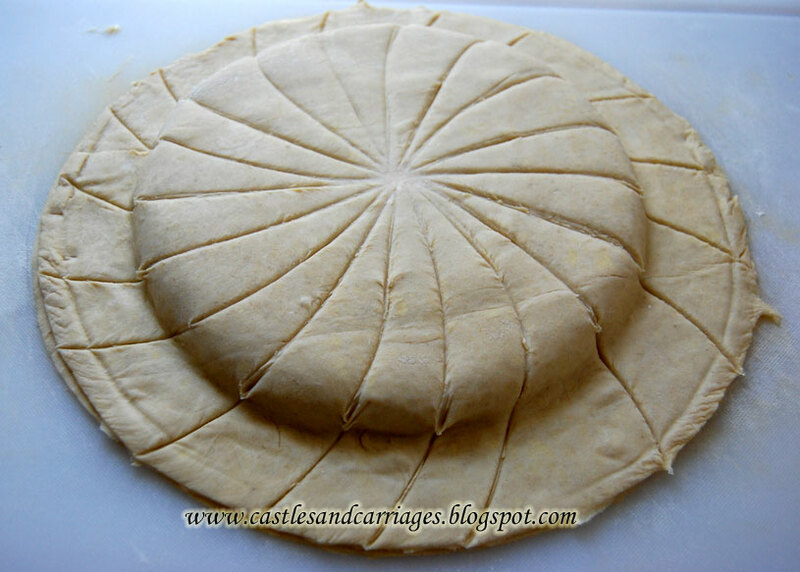 Keep in mind that the frozen puff pastry needs to defrost overnight so plan accordingly. I also did not have a tart pan large enough for this galette so I used a pizza pan. Defrost pastry puff (Pepperidge Farms has a good one) overnight. Unwrap pastry puff. 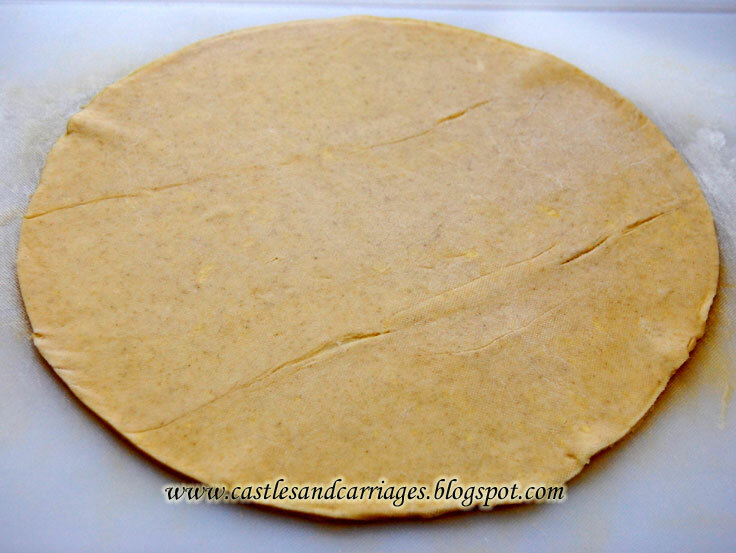 Take one sheet and roll out so that you can cut out an 11" circle (I used one of my dinner plates). 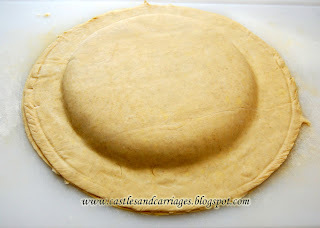 Repeat for the second sheet of pastry puff but make the second circle a little larger (about 1/4th of an inch larger). Refrigerate both circles while filling is being made. 3. Place the almond paste into a food processor or blender with about half of the sugar, and process until well blended. Add the butter and remaining sugar and process until smooth, then blend in 1 egg, vanilla extract, almond extract, flour and salt. Set aside. 4. Place the smaller puff pastry circle onto a sheet of parchment paper (this will make lifting the Galette des Rois much easier when finished). Whisk one tablespoon of milk with egg yolk. 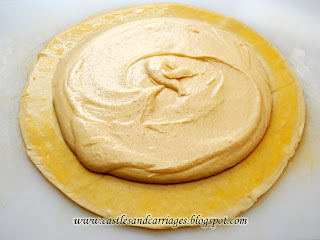 Brush egg yolk mixture an inch around the margin of the puff pastry circle. Mound the almond filling onto the center of the pastry. Press the bean or feve down into the filling. 5. 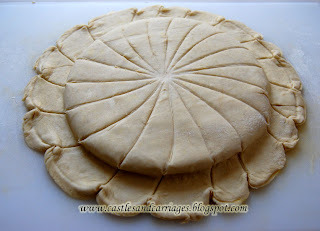 Carefully place the larger puff pastry circle on top of the first one. Smooth out the puff pastry and seal the edges. 6. 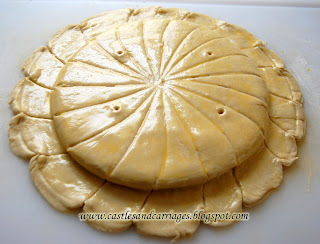 Now you may score the top layer of pastry puff (without slicing too deep so that the filling seeps through) with a sharp knife using whatever design you want. I chose a sun ray pattern but you can make a cross-hatch or floral pattern. 7. 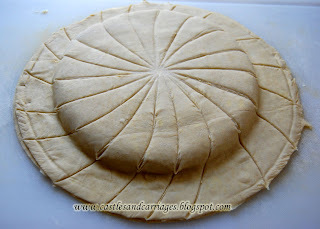 Using the blunt edge of a butter knife, gently push the edges of galette to make a festooning pattern. 8. 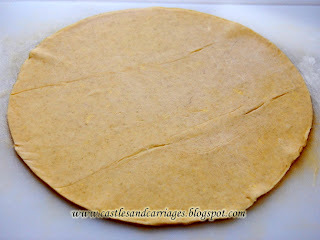 Using the rest of the egg wash, brush the top of the galette. 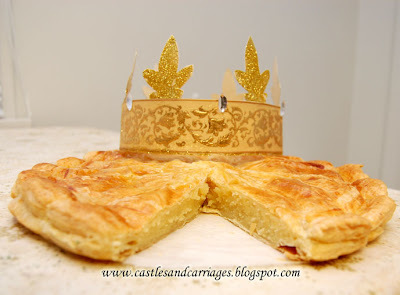 Do not get the egg wash on the edges of the pastry because it will not puff up as nicely. 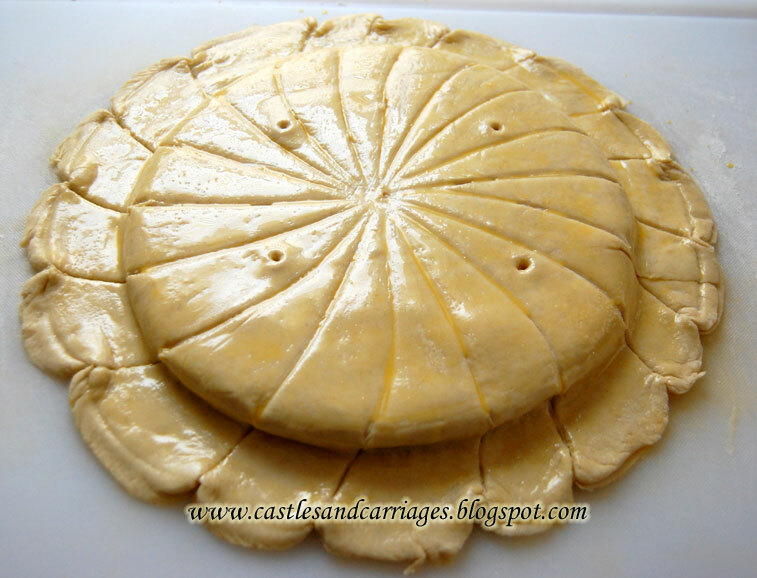 Then poke 5 holes in the pastry as seen above (one in the center and four along the sides) so the galette will rise evenly. 9. Bake for about 28 minutes. Then mix one tablespoon of powdered sugar with one tablespoon of boiling hot water and brush this glaze on top of the galette to make a shiny finish. Bake for 2 more minutes. 10. Allow the galette to cool completely before serving. 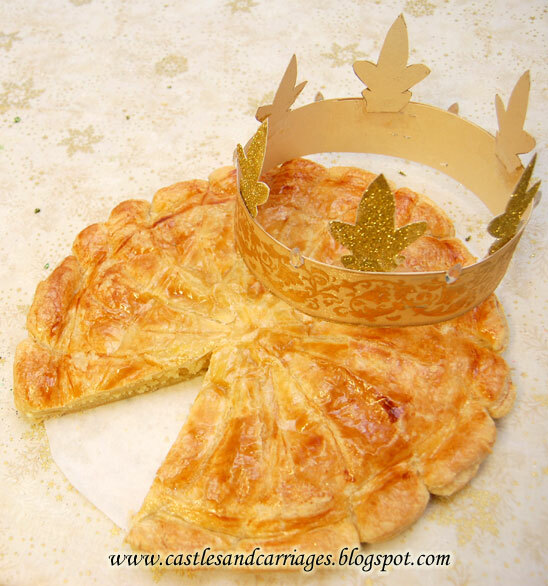 If you decide to hide a feve inside the galette warn your guests beforehand so they don't accidentally swallow it or crack a tooth! So pretty! 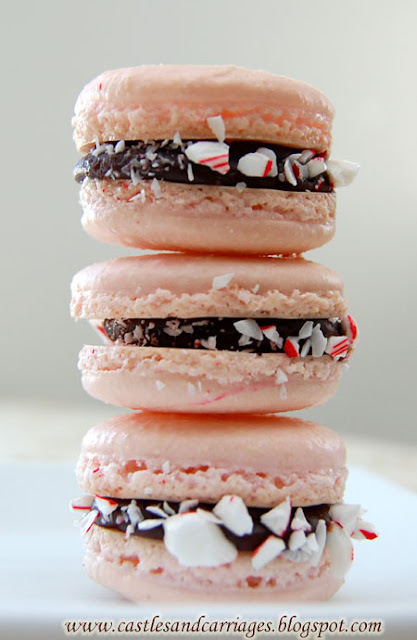 I would love this - I love almond paste! 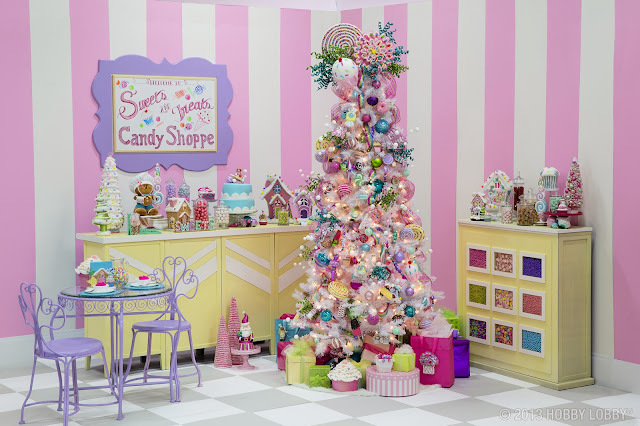 Thanks for sharing on Crazy Sweet Tuesday and Happy New Year! My husband said that this tastes just like something out of a fancy bakery. It really is delicious and not too sweet which I like. Thank you Dorothy and Mrs Fox for your kind comments!